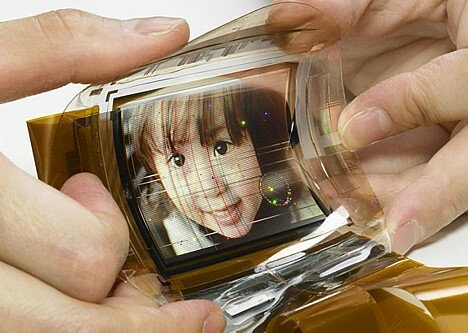 On May 24, Sony unveiled what it is calling the world's first flexible, full-color organic light emitting diode (OLED) display built on organic thin-film transistor (TFT) technology. OLEDs typically use a glass substrate, but Sony researchers developed new technology for forming organic TFT on a plastic substrate, enabling them to create a thin, lightweight and flexible full-color display. The 2.5-inch prototype display supports 16.8 million colors at a 120 x 160 pixel resolution (80 ppi, .318-mm pixel pitch), is 0.3 mm thick and weighs 1.5 grams without the driver. According to Sony, which plans to release a new line of miniature TVs this year and is bolstering efforts to develop next-generation flat-panel OLEDs, this new technology will lead to the development of thinner, lighter and softer electronics. The company is scheduled to present the results of its research at the SID 2007 International Symposium now underway in the US. Frickin' wow! When do I get my flexy TV bracelet? SWEET JESUS that's cool! Finally! One day we'll have sticker-tv screen ! The future is most definitely almost here! I wonder how long it will be until we can have mobile wrist watches with video phones in them... and will we be alive to see them lol. wedding songs ???? - ???? ???? - ???? ???? ?????? - ???? ???????? - ???? ???? ?????? - ???? ???? ?????? THIS IS.... how to put this into 3 words or less... FUCKINGLY INEFFABLY AWSOME!!!!! Clipset » Blog Archive » M�s ePaper… �es la guerra! schermo oled flessibile da Sony [Video] « MalagutiMania�>%Blog�!? @# quando Google non basta!